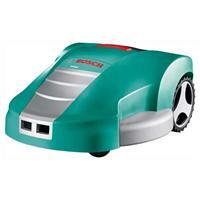 First ever Robotic Mower from Bosch! If you have neither the time nor inclination to put-in the hard work that’s required to create the perfect lawn but nevertheless like the idea of one this battery-powered robotic lawn mower from Bosch is the answer. You’ll find it quick and easy to set up – just find a suitable location for the docking-station; layout the rail-wire around the perimeter of the area you wish to mown; and then programme the time you want the machine to begin work. After this almost no human intervention is required and you can get on with the things you’d prefer to be doing. Brand new to the Bosch range of gardening equipment for 2013 is the Indego Robotic lawnmower with a 26cm cutting width and 10 different mowing heights. Powered by a lithium ion 32v battery the Bosch Indego cuts the lawn automatically without you having to do the hard work. Sit back and relax while the lawn is mown for you. The most time saving mower you will find to help around the garden. The Bosch Indego has a cutting area of up to 1000 square metres. The Indego can mow approx 2000 square feet in 20 minutes depending on the lawn type. The Indego will then return to it's base recharge and go out again if needed. Lawnmowers UK have 2 vouchers running. Use Voucher Code LAWNMOWERS20 at Lawnmowers UK to save £20 when you spend £350. Use Voucher Code LAWNMOWERS25 at Lawnmowers UK to save £25 when you spend £600. Tooled-Up have a voucher running for the month of May allowing you to save up to £7.50 on new lawn equipment. Use Voucher Code SEVEN50MAY at Tooled-Up to save £7.50 on orders over £75. These vouchers are valid until 31st May 2013. We have just added some new Brill lawnmowers to the range - now there are some electric and petrol rotary mowers available at the best possible prices. Brill mowers are designed and made in Germany and are good value for money, offering intelligent design and innovation. Now that we are having some nicer warmer weather you can really get started working on your lawn. Now that the ground conditions are suitable, and shouldn't be too wet and muddy, you can get your lawn mowers out and start cutting. The first cut of the year should only take the top of the grass off. Any close cutting at this early stage could lead to severe yellowing or browning. For the first month or so only cut every other week or so - don't over do it yet!! Once we get further into the spring, especially if the weather stays as it has been recently, mow more often - just enough to stop the grass growing too long. You can dig out any patches of coarse / rough grass or weeds that aren't responding to chemical treatment, and then re-seed any bare patches left, remembering to water them in. You can treat the grass to a feed in April if it is in need of a pick me up and the weather conditions are right for the treatment you have. We have just listed 2 brand new lawn mower maintenance kits in our equally new Lawn Mower Maintenance category. First up we have the Handy Lawn Mower Starter Kit which is an excellent starter kit for those of you who might have just purcahsed your first petrol lawn mower or garden tool, or for those of you who's equipment has seen better days. This excellent kit contains a 5 litre petrol can, a filler funnel and 600ml of SAE30 oil - everything you need to get your petrol mower going. 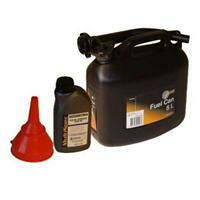 When the time comes to tackle the messy job of lawnmower oil changes we also have the Handy Lawn Mower Oil Change Kit. 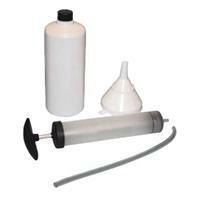 The lawn mower oil change kit includes a 1 Litre waste oil container, 0.3 Litre oil extraction pump and a funnel - all the items you need to drain the oil cleanly and easily. So now there is no excuse for your petrol lawn mower or garden tool to not be running in tip top condition! Keen Gardener has a voucher running until the spring offering a great 5% off any purchase. Use Voucher Code KEENPRICE74 at Keen Gardener to save 5%. This voucher code is valid until 30th April 2012. Tooled-Up have 2 vouchers running for the month of February allowing you to save up to £10 on new lawn equipment. Use Voucher Code FEBTEN12 at Tooled-Up to save £10 on orders over £100. Use Voucher Code FEBFIVE12 at Tooled-Up to save £5 on orders over £50, so if you are after a cheaper mower you don't lose out on the discounts! These vouchers are valid until 29th Feb 2012. Snow is great fun for the kids (and the big kids) but be slightly wary if you want to have a beautiful lawn later on in the year. Having snow on your lawn isn't really an issue, but a fungal disease called snow mould can develop once the snow thaws. The snow mould most commonly develops where dense areas of snow have been piled up, such as in the spot where a snow man has been built (remember your snowman is usually staring in at you through the window long after the ground covering has gone! ), or if you've cleared your paths or driveways and built up piles of snow on the lawn. Try and avoid this because the snow mould can kill areas of the grass. There isn't a great deal for you to do in January, but there are a couple of important points to note to ensure your lawn is able to get back into tip top shape later on in the year. As my Mum always used to tell me - Keep off the grass if it is frozen or heavily water logged. Believe it or not, walking on frozen grass actuallly "injures" it! Any damage to grass that was frosty probablly won't be seen immediately, but you will notice it within 12 to 48 hours after you have done the damage. Sometimes the grass will go a purple or black colour, before it turns brown as it dies. Dead grass will leave areas for weeds to develop, and damaged grass that does not die will be more prone to diseases. The actual nature of the injury isn't completely clear, but some people say that the cells of the grass are damaged because the water in the leaf tissue is frozen, it is brittle - literally snapping the blade of grass. Some believe that the crystallised water punctures through the blades of grass in thousands of places creating "wounds" that cannot heal. Also (if not frozen or waterlogged) ensure you clear any leaves that you may not have cleared at the end of the autumn - this will stop them rotting on the lawn, and also allow air and light to get to the grass. We have added a range of lawn and leaf sweepers to lawnmowerguide today, just in time for the big Autumn clean up. For those of you who are unfamiliar with what a Lawn Sweeper is, they are for clearing leaves and debris from your lawn or even hard standing areas in a quick and easy way. Most of them work using an inbuilt brush which flicks up the leaves and collects them into an onboard hopper - which you can then empty into sacks, or even better into your compost bins! The Leaf Sweepers make the job of clearing the lawn much easier than traditional methods of using a rake or even powered garden vacuums - especially when you have a large lawn or garden to look after. The rotating brushes will sweep up leaves, pine cones, acorns, dry grass cuttings, litter, wood chippings and even dirt and grime. There are primarily two types available - Push Lawn Sweeper models that have to be manually pushed across the lawn, or Towed Lawn Sweepers that are design to be towed behind ride on or tractor mowers. 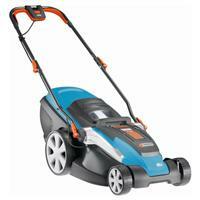 Gardena Lawn Mower Range now available on lawnmowerguide! 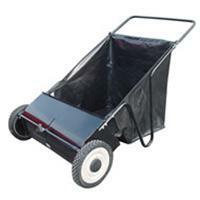 The latest lawn mowers from Gardena are now available on lawnmowerguide.co.uk. There are currently three mowers in the range, 2 cordless and one electric rotary style mowers. All of the machines allow you to either collect grass cuttings from mowing, directly in the integrated Grass Catcher, or use the mulching function. The mulch function directly chops grass cuttings during mowing and distributes them over the lawn as a natural fertiliser. The electric rotary mower is a 36cm cutting width model, which thanks to it's powerful motor deals with every type of lawn, even tall or damp grass. This is the blog of Lawn Mower Guide (lawnmowerguide.co.uk) - our website has been created to help you find the perfect lawn mower to enable you to keep your lawn in tip top shape with the least amount of effort. We have researched the hundreds of available models of lawnmower out there, and brought together all the features, specifications and details about each mower that will allow you to make an informed purchase. This blog will bring you news of new models and special deals to make sure you don't miss out!